The past twelve months have been like no others in our family, and now we are radically transformed from the way we started. I’ve realized that in many ways parenting through these kinds of changes is the hardest parenting of all. My separation brought with it some serious positives, not the least of which has been a respite from fighting, hostility, and other perpetual undercurrents. And though I deeply mourn it, the end of my marriage has definitely brought some relief. And not just for me. For my daughters, there is a new sense of peace in their day to day lives. However, I have still broken an important contract with them–the contract that says that their mommy and daddy are supposed to stay together forever. That vows are permanent. That love is unconditional and never changing and that nothing will ever break us. I thought that, too, but I was wrong. And kids, even when they recover from the initial shock of a family torn apart, seem to think that for a season anything goes and it becomes a psychological battle within yourself as a parent not to let them be right. It’s so tempting to spoil them, let them rule the roost, make up for everything by letting all the rules fall apart. But I can’t and I don’t even though there is a new layer of childish frustration when the hammer has to come down. Finding balance is always the challenge, but it’s a new balance point. I can’t let the most important things slip–like the expectation of respectfulness in act and deed. But some things can slip a bit, like letting them crawl into bed with me a few times when they wake in the middle of the night, or curling up with one extra story at bedtime. And sometimes I just need to hug them a little bit longer than usual, until they are wriggling and squiggling out of my grasp. Kids are resilient, but so are adults. Together, we take one step forward at a time and muddle through as best we can. This is one of those nights when I should be sleeping, need to be sleeping, but I can’t. Even though seven a.m. will come too soon and I will need to get up for another day of kid activities and sports, I can’t shut off my brain long enough to fall asleep. The hardest part of being a single mom is never getting to tag in that someone else. When it’s me and the girls it’s all me, and there are no moments to simply step away and let someone else jump in when I’m getting frustrated. And there have been more of those moments when I wish I could do that, as the girls work through and process their own emotions as our family changes. In their immaturity, they don’t know how to just tighten up their belts and move forward, bury their pain and find the strength to put one foot in front of the other. And this is probably a good thing, for adults try too hard sometimes to bury and hide the reality of what we are going through. I see that in myself. Most of the time I feel strong and able to move forward, seeking positivity and my faith to comfort me and help me cope. But I have these bleak moments when I want to just sink to the floor and weep or pound my fists against the wall or scream into a pillow until I am hoarse. I have to be careful to find productive outlets for this, and to truly embrace the positive instead of superficially pretending to, otherwise I will fall apart. And because my ability to cope and draw on my own inner strength is intricately connected to my ability to handle it with grace and compassion when my little girls seem to be falling apart… Those nights when they get too tired and they lose their grip on their own strength… these could be a death spiral if I don’t allow myself to work through everything properly and find true healing. And so most of the time I move forward,and I succeed at truly putting one foot in front of the over. Yet there are these other nights when sleep escapes me and the house is too quiet and I feel out of sorts. I can hear my youngest snoring from the other room and the rhyming click of the fan above my head and the occasional car pass on the street outside. Normally all of these sounds would be invisible, but on nights like tonight they are like a loud symphony making sleep impossible. And my horrible brain won’t stop. I haven’t written in a long time… life got busy. Canning and other projects ceased as I tried to refocus my time on living in the moment and being present with my children in the limited moments of their childhood. And in many ways I’m not sure that I felt that I had much to say. I’m still not sure that I do, but nevertheless I find myself compelled to write again. As my life takes me in unexpected directions, I feel compelled to put thoughts into words again. And maybe this is perfect, because picking oneself up and moving forward in the midst of chaos is probably the ultimate definition of being a Best Intentions Mom. So here goes… somewhat suddenly I have found myself a single mom. Never in a million years did I think that this would be the case, but it is. My best intentions did not save me from this fate. The hardest part is being on my own most of the time. And the occasional temporary bouts of melancholia. Most of the time I feel strong. I have had to be strong for so long, it’s old hat. But there are these moments, here and there, where I feel overwhelmed or weak or just crushed by a heavy weight in my heart. Tonight is one of those moments. Nearly two months since I became a single mom and at once it feels like an eternity and a blink of an eye at the same time. I am learning a lot about my daughters. I never knew that my oldest could be so insightful, piece together bits of information and process them in such sophisticated ways. I thought she would repress her feelings and in the beginning she started to, but she has responded better to counseling than I could have ever imagined and she has blown me away with the way she talks about her feelings and the world she now lives in. I never knew my youngest could be so fierce. I knew she was passionate, but I hadn’t seen in her such a remarkable capacity to throw her mind behind her heart in all things. I am more afraid of her adolescence than I ever was before. But at the same time, I look forward to it because she will be the one curling up with me to watch Nicholas Sparks movies, a box of tissues and some ice cream at hand. She is the one who laughs loudest, cries hardest, loves the fiercest. I admire her passion. I am also learning more about myself. I am seeing pieces of an old me return but in new ways, and I am discovering pieces of myself that I didn’t even really know existed. I had no idea I could be so chipper in the morning, once I finally get out of bed. I had no idea I was such an old lady-perfectly content to listen to some classical music and go to bed at 9:30 at night. It’s not easy, and there are times when the old self doubts return and I wonder if I am destined to be alone for the rest of my life. For my followers here at Best Intentions Mom, I wanted to let you know that I have launched a new blog to fully document our family’s paleo/primal journey. 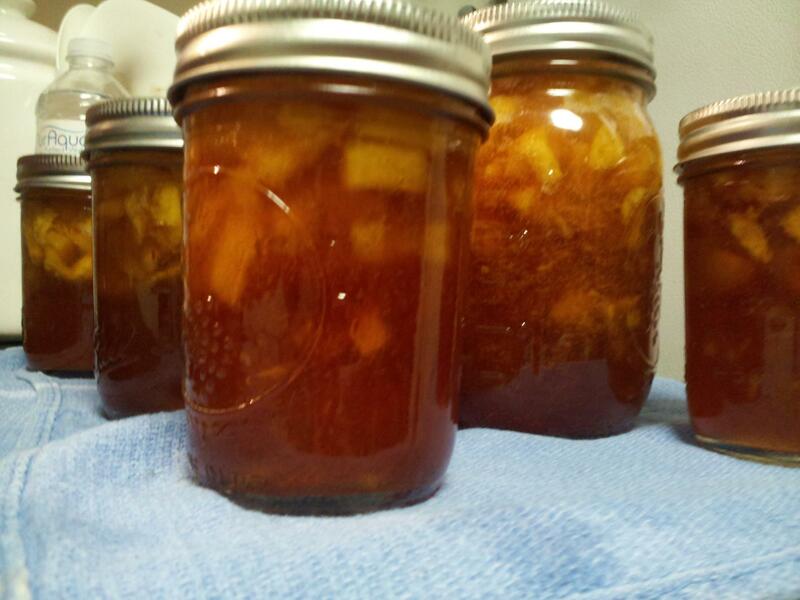 Some information will cross over between the two, but this will better allow me to focus one blog on our primal lifestyle, and continue to focus this blog on our family’s variety of interests such as sewing, gardening, canning and cooking. In the two weeks since our family went primal, the biggest surprise has not been the weight I have lost, the improved attention span and behavior of my children, or the increased energy I feel every day. The biggest surprise has been how much my taste buds seem to have changed. Even in such a short time, my sensitivity to sweet has skyrocketed and my sensitivity to bitterness seems to have decreased. Yesterday I spotted my favorite treat at the store–cream-filled chocolate Easter candy eggs. The stores are at it again, pushing every holiday back. Shrugging it off as a “20%” indulgence, I decided to splurge a bit. The irony was, however, that I didn’t enjoy it at all. It tasted far too sweet, artificial, and almost overwhelming. It left a strong unpleasant aftertaste in my mouth that I couldn’t stand. I immediately ate some real food to offset the experience. And I was overjoyed–any craving I could have had to plunge myself back into sugary fake food indulgences was totally erased. The truth is, once you break the addiction to chemicals and sugar and additives, and once you get used to eating the food your body was designed to consume, it suddenly seems impossible to go back. I realize this is only truly the beginning of my family’s journey, but so much has changed so dramatically in such a short time that it almost feels as if we have been on this journey for a long time. And perhaps we have, as we have read and read and learned about food production and nutrition and health. Learning how to can and preserve and trying to grow a patio container garden with a few herbs and vegetables were baby steps upon the journey, as well. Our desire to own some land and grow and raise our own food is also tied into this whole desire to return to what it really means to be human. Food may be only one part of that humanness, but I am coming to realize what a critical part of us it is. In one sense, everything pivots on the axis that is food–our health, our vitality, our relationship with the planet all revolve around the simple question of what we put in our mouth. Somehow everything is tied to this one aspect of life. My oldest asks me at every meal now what each vegetable on her plate does for her body. She is fascinated by nutrition and learning about what makes her body strong and healthy. I have watched her try foods she fought to try before just because she found out they were good for her skin or her eyes or her brain. She is cleaning her plate better after two weeks of real food than she ever did before. And her sister is slowly following suit. I am more convinced than ever before, our bodies want to be healthy. Friday i found myself sitting next to a box of cookies in the cubicle next to me, and I did not feel the least bit tempted. Less than a week after beginning to eat Primal, and whatever mild craving my body might have felt was totally overruled by how amazing I felt without eating all the junk our world has to offer. I felt, and continue to feel, energetic, happier, and (at the risk of sounding cliché) more alive. It is hard to describe how different I feel without sounding like a living advertisement. I literally had no desire to dive into the box of cookies next door, even though a week before I would have had little ability to control myself. 1) I have lost six pounds. Without exercising more than usual—in fact, given the holidays I have probably exercised less. 2) My skin feels better—smoother, softer, more moisturized. I have always struggled with very dry skin, but I have also always hated moisturizers. My skin feels dramatically different. 3) My double chin is beginning to disappear. 4) My body feels more “even-keel” throughout the day. When I get hungry now, there is no accompanying nausea or light-headedness. My lifelong battle with hypoglycemia appears to have vanished in a matter of a few days without grains or processed foods. 5) My head feels clearer. I am having an easier time concentrating at work. Obviously, this is huge. 6) My attention span seems longer. I am not finding myself so easy to distract, nor so desiring of a distraction. 7) I feel more alive. I don’t feel sickly. I don’t feel as if I’m on the verge of contracting something. I don’t feel weighed down and narcoleptic. I barely need any caffeine anymore, and when I do my small glass of green tea is more than enough. 8) At the end of the day, I find I can fall asleep with amazing speed. 9) I’m keeping up better with my children. I don’t feel three times my age anymore, struggling to keep up with two energetic toddlers. I am optimistic I will continue to see improvements in this area and maybe, someday, I will be able to give them a run for their money. It sounds almost a little ridiculous, but everything seems better. Unlike every other diet or regimen I have ever tried, I am not hungry, full of cravings, or exhausted. It is remarkable. And the best part is, this is a family affair. In addition to my husband’s gluten issues, we had begun to notice my oldest daughter complain of stomach aches after eating wheat heavy meals. My husband has a genetic pre-disposition for Celiac disease, so it seemed a likely cause of her discomfort. , it seemed somewhat inevitable. I also found myself getting sick frequently and feeling perpetually rundown. At thirty one, it just didn’t seem like this was how life was supposed to be. And truthfully, after reading and researching as much as I have on nutrition and food production in the last year, this path was probably inevitable. My mother’s first question after a few days primal was how the kids were adjusting. Pretty well, actually… We have always cooked a lot of things that were low gluten, thanks to my husband, they love vegetables, they love the new juicer, and they are generally pretty good natured kids. (We won the battle over picky eating early, thank goodness). Time will tell how they fully adjust. For now it has been a wonderful adjustment. I am so excited to begin this journey as a woman, wife and mom who has nothing but the best intentions. Most of the time my household runs relatively smoothly. Oh sure, the sink is never without dirty dishes and the laundry gets put away less often than I would like to admit, but despite all of that for the most part this ship runs well. But there are days, every once in awhile, that could test the patience of a saint. Today was one of those days. The ironic thing is that those are the days that make me full of joy and contentment with my 9 to 5 and temporarily erase any guilt or desire I might feel over my inability to be a stay at home mom. Those moms should qualify for sainthood–every single one of them. Because at the end of the day, I get to escape for eight and a half hours, five days a week and only multi-task three or four things at once. I don’t know who coined the term terrible twos, but I’m beginning to think they were off by a year. Two was no problem, but three going on four seems to be where the battle really is. Oh, my two year old is willful, but she’s handle-able for the most part. My almost four year old could drive someone to drink. It’s as if she was suddenly replaced by a miniature fifteen year old. Suddenly she knows her own mind, has all the wisdom of the world, and can do everything herself. Or so she thinks. Evidently I am but an accessory to her life–and an inconvenient one at that. I’m trying to decide exactly where tonight went wrong, but I think the only thing that could have prevented catastrophe would have been to have put her to bed immediately when I got home. Not practical nor possible. The truth is, as much as we moms like to project the image that we have everything all together and perfect, the minute you involve the will of someone else, perfection becomes impossible. 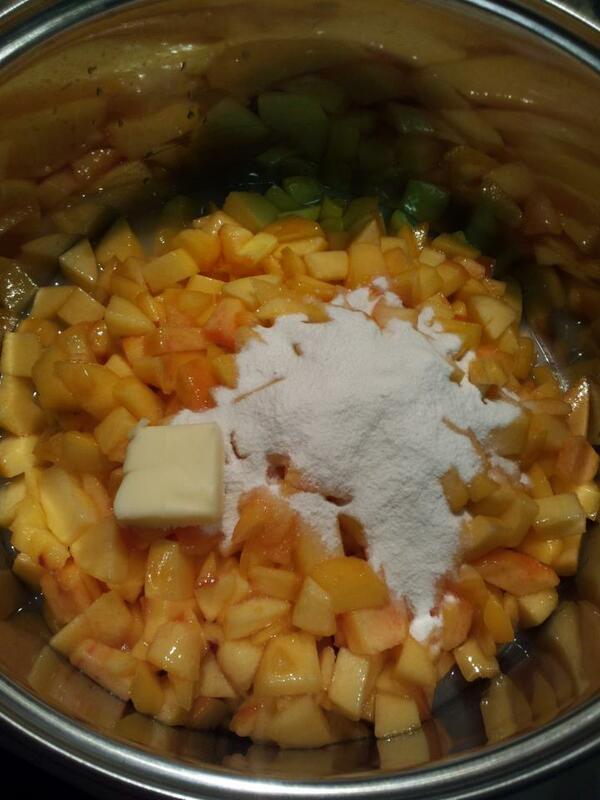 Mix the sugar and spices in a large bowl and set aside. 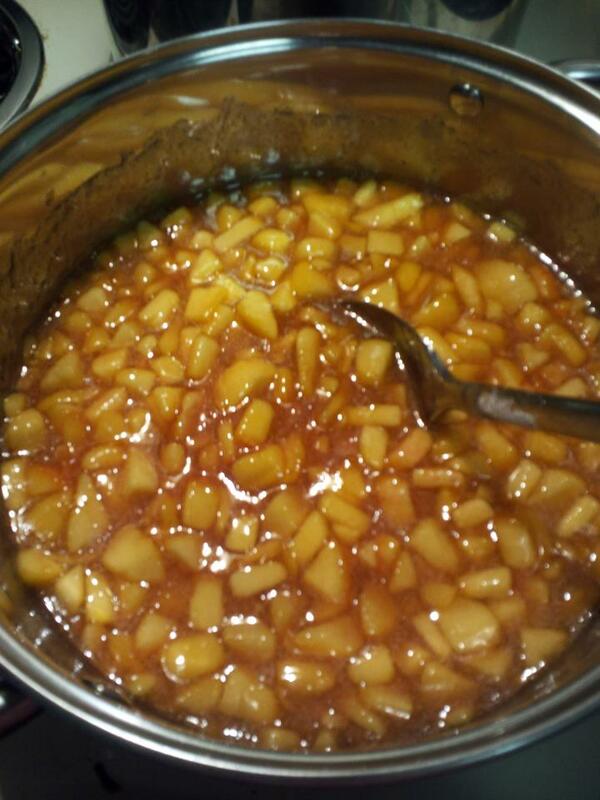 In your pot, mix chopped nectarine, lemon juice, pectin and butter. Stir constantly as you bring it to a boil over high heat. 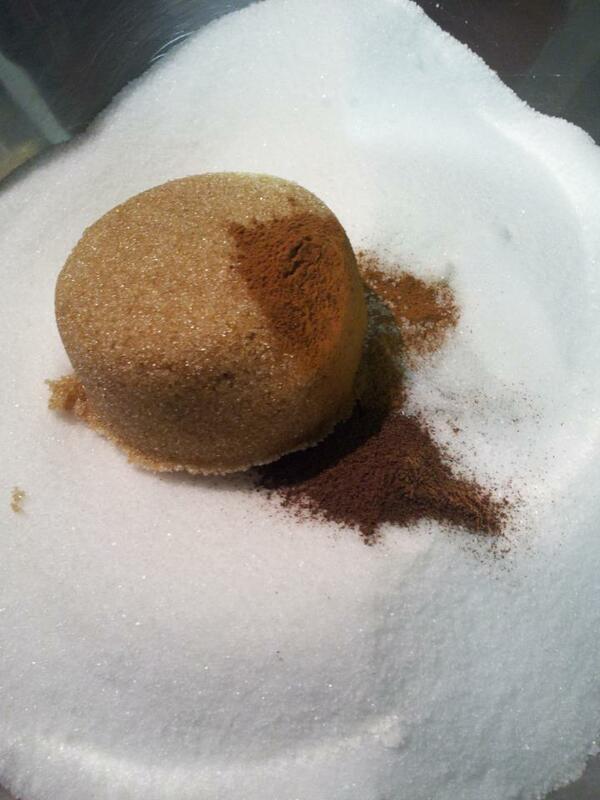 When it is at a full, rolling boil add the sugar mixture and stir it well. Bring it back to a full boil and let it boil hard for 5-6 minutes, stirring constantly. Remove it from the heat and “skim the scum”–use a stainless steel spoon to skim off the excess foam. Pour it into your jars leaving a 1/4 inch head-space and process in the water canner for about 15 minutes. This recipe had me not only licking the spoon when I was done but scraping out the bottom of the pot for every last drop of goodness. Slight modifications to this recipe would probably make an excellent pie filling or cobbler, which I will probably get around to trying if I can find nectarines or peaches this ripe again. Certified Organic: 95% or more organic, not including water or salt and certified by the USDA. Made with Organic Ingredients: 70% or more organic, also USDA certified. Natural: Product contains no artificial flavors, colors, or preservatives. However, it can still be highly processed, and it does not have to have been grown organically. FDA regulated. Naturally raised: Animals were not given antibiotics or fed animal by-products, etc. However, they could have been raised in cramped cages, warehouses, etc. on large mass-agricultural farms. Nothing in this label ensures any type of humane or organic farming practice. GMO Free: Product has not been knowingly genetically modified. This is unregulated but is instead a voluntary labeling. Additionally, cross pollination could still contaminate products. Fair Trade: Product was produced in a “socially responsible way” as determined by the Fairtrade Labelling Organizations International. Products are certified by TransFair USA. Cage Free: Egg-laying hens are not kept in cages. However, they could still be crowded inside barns with their wings, feet and beaks clipped, and no one certifies this label. Free Range: The bird (only applies to poultry meat) had “access” at least once a day to the outdoors for an unspecified period of time. This could have been minutes, and they don’t have to have actually gone outside. The USDA certifies this label. Certified Humane Raised and Handled: Meets the standards set by Humane Farm Animal Care, and is certified by inspectors. Hormone Free: Animals were not injected with hormones, certified by the USDA. Again, this says nothing as to how the animals were raised or handled beyond that they were not given rBST, rBGH or Prosilac. Free range, free roaming or pasture raised (beef, lamb or pork): Unregulated label, so meaning could vary drastically. Grass-Fed Beef: 99% of animal’s food source is forage from pasture or harvested grass. This is a sampling of the most common labels, and does not even begin to address all the labels for cleaners or other household products. Unfortunately, our current food labeling process essentially forces everyone to become an expert or risk ingesting chemicals they do not want or eating food raised in conditions they do not support. Uniform, inspected and certified labeling is needed to change this. Loux, Renee, 2008. Easy Green Living. Rodale.